This old snapshot is a bit of a mystery. It is believed to be taken at Mansfield Woodhouse and suggests people are waiting for someone important as both the boy on the wall and the lady with the pram are holding flags. Maybe someone can add further information! Mansfield Woodhouse photo!! I think the building to the right is the Greyhound Pub. MW library published a book, turning back the pages of MW in 2001, compiled by Veda Kay and Jayne Sheppard. 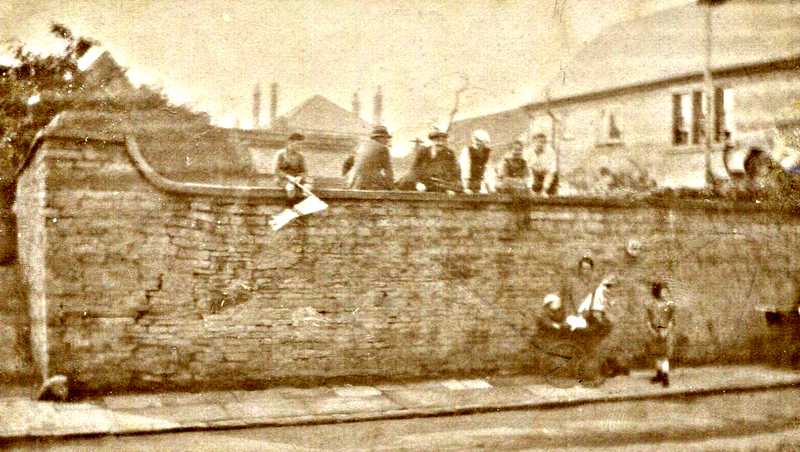 On page 16, the tram lines are being laid in 1907 and the capped wall where people are sat can be seen near the Greyhound Pub. What were the people waving flags for, in 1901 Woodhouse was decorated for the return of General Coke from the Boer War, there is a snap showing this on page 18. In the background can be seen the roof of a large house, this was The Poplars, a large detached house accsessed from Welbeck Road and demolished 2 years ago. On page 15 Warsop Road there is an archway decorated for the Coronation of King George the 5th outside the Star Inn in 1911. Anyone guess what the celebration was for, Coronation or General Coke’s return!! There is a copy of the book in Woodhouse Library, local history section but they were on sale in Mansfield and Woodhouse library for a time.